Why use a Platinum RTD Sensor? Platinum Resistance Temperature Detectors (RTDs) are highly stable temperature sensors widely used throughout all industries. Our Pt elements are made using a thin layer of Platinum deposited onto a ceramic substrate, laser-trimmed and glass sealed to meet the exacting requirements of DIN EN 60751 (IEC 751). They have a linear PTC characteristic which is very well defined and readily interchangeable with other Platinum sensors of the same tolerance class; Class A, Class B, 1/3 Din, etc. They have been used for many decades to measure temperature in laboratory and industrial processes and have a deserved reputation for high accuracy, excellent repeatability and high stability. We also supply IP68 rated Platinum sensors and SKTY PTC linear sensors which have a steeper slope offering improved accuracy up to 150°C. For applications where a high IP rating is required, our ATC Semitec IP68 Pt100 (or Pt500/Pt1000) sensors ensure that water ingress will not be a problem. Moulded in TPE, the sensing portion is 5mm dia. x 20mm long and is available in single or double-insulated formats. The double-insulated versions offer a dielectric strength up to 3.75kV. Suitable for continuous use from -50/+110°C, they can also be used to 125°C for periods of up to 3000 hours. Utilising one of our platinum RTD elements, we supply Pt100, Pt500 or Pt1000 class B sensors with an accuracy of ±0.15K. 4 wire Class A platinum sensors are available offering an even higher degree of accuracy. The SKTY series linear PTC sensing elements from ATC Semitec offer neat replacements for the once common KTY temperature sensors. 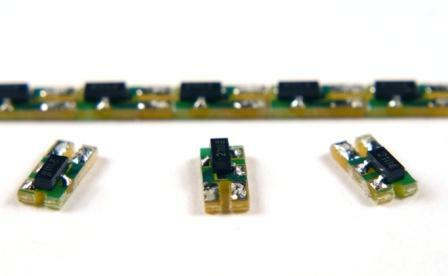 Our SKTY sensor elements are mounted on a small 3mm x 6mm p.c.b. and are available with R25 values of 1kohm and 2kohm with ±1% tolerances. SKTYs can also be supplied as IP68 rated moulded sensors (see above) with single or double-insulated leads. Other custom probe formats also available as required. To compliment our IP68 temperature sensors, a wide range of mounting options are available by employing integral or separate thermowell systems in stainless steel. Please contact our technical sales team for further details. ATC Semitec’s SPT range of thin-film 2-wire platinum sensors are some of the smallest RTD elements available and conform to DIN EN 60751 (IEC 751). Based on a 2mm x 2mm x 0.8mm ceramic substrate, Pt100, Pt500 or Pt1000 sensor elements are laser-trimmed for high accuracy and sealed in glass to ensure complete integrity. Highly stable and suitable for use up to 500°C (Class B) or 300°C (Class A). Cryogenic class B versions suitable for use down to -196°C are also available. R0 values of 100ohms, 500ohms and 1000ohms are stock items with Class A and B tolerances. 2mm x 10mm long versions also available where a longer sensing element is desirable.